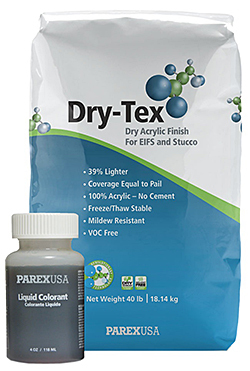 Dry-Texs acrylic finish for EIFS and stucco uses dry polymer technology. It is packaged in a 40-pound bag and yields the same coverage as a 65-pound pail of finish, once mixed in a 5-gallon pail, according to the company. It is freeze/thaw stable and VOC free.